Plot: An unseen man regains consciousness, not knowing who or where he is. No one seems to be able to see him, except a mysterious man dressed in black. He eventually learns through their discussions that this man is a XIXth century french aristocrat. 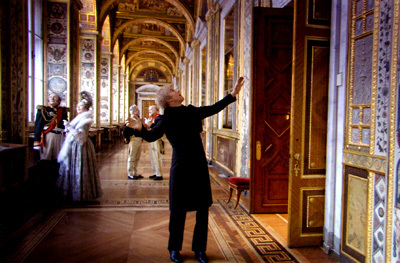 Together they travel through the Hermitage museum of St. Petersburg in a time-span of over two centuries.